Mazy Runs, No Escape, Throw-In Frenzy and Soccer Nuts - the fun never stops with this simple approach to coaching! Make a mazy run before putting a cross in, deal with non-stop throw-ins, and judge the correct weight to stop a ball in a precise spot. These are all skills learned through games with the help of Fun Soccer Games for 9 to 11 year olds. Authored by Keith Boanas, a 35-year veteran of the game as an English Football Association Coach Educator, these are some of his favourite games, tried and tested on generations of youngsters. They are designed to energise and excite your little players without putting too much pressure on you! 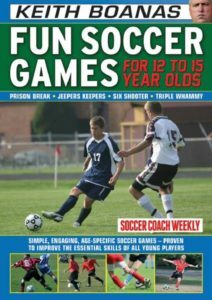 Keith’s skill in this best-selling and value for money manual is to convert basic soccer skills into games linked to fun and excitement and subjects the kids identify with. The approach is not about barking orders but encouraging effort, flair, teamwork by letting the game be the teacher. This age group presents a slight challenge in that they are more aware of the “real” game – and some games reflect this. The manual also contains Keith’s 25 Top Tips for Coaching 9 to 11 Year Olds. What can Fun Soccer Games for 9 to 11 Year Olds do for your players? Fun soccer games is a fantastic resource that offers a variety of skill development through fun, engaging games that helps increase players love for the game. Just to say, I have downloaded the PDF of 'Fun Soccer Games for 9 to 11 year olds'...absolutely brilliant! Looking to purchase more guides from yourselves. I'm a Level 2 coach at Aylesbury Town FC, coaching under 9, 11 and 18's, a good mix, the addition of fun to the training works at all ages and your coaching aids seem to have the edge over the standard sessions I have learnt so far. "I've been actively using Keith’s "Fun Soccer Games" for a while now to great effect. Coaching a group of 32 ten year old's is always a challenge to keep things fresh and most of all fun and this product has been invaluable for that. Being based in Australia, the PDF delivery option is a great way for international coaches to get immediate access to this content at a very reasonable price. I would wholeheartedly recommend this product to anyone coaching younger players." The Manual has been a great help when coaching my sessions. My students often come tired from school, but with the Fun Soccer Games I get their interest immediately in the training session. Also, I have found that you can use several variations to improve their technique and the games can be used as well with older students. As an new coach I was looking for new and innovative ideas that would keep my team happy and interested in the sessions that I was coaching. Fun Soccer Games did just that, what it also did without them realising was teach them how to play football not only as individuals, but as a team through fun. From my point of view as a coach, it made my life so much easier setting sessions up each week and keeping things fresh. Ordering the books could not be easier through a safe and secure web site, having the option of PDF download so you have instant access, or, if you are like me having the physical book in your hand within a matter of days. Highly recommended to coaches young and old. I was very impressed with the Fun Soccer Games manual. It is very easy to read and understand. I have used all of the drills with my U11’s team and they have loved them! I thought the layout of the practices, the simplicity of the ordering process, and the easy-to-use PDF format were all excellent. As a 'non-specialist' football coach, I found the drills provided a very good set of 'visual' ideas for communicating with younger players - even those who thought themselves 'too professional' found the fun and enjoyment in the games. Well done.